Standard schnauzer Gaia lounges on the back porch with Dagmar. The porch has speakers for music, installed by SmartHome Solutions under the pine plank ceiling. The wicker furniture is from Wayfair. Two oversize couches from Restoration Hardware provide ample seating in the modern living room. The footstool comes from Design House Stockholm, and the bronze lamp was purchased at Antiques on Nine. 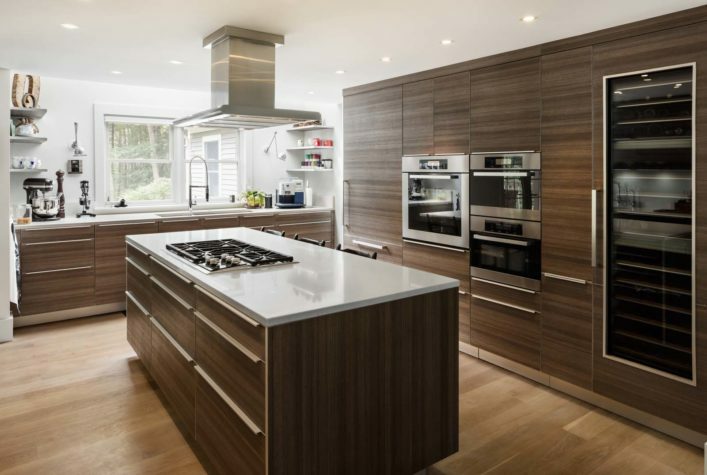 This sleek, modern kitchen cabinetry is Poggenpohl, the stovetop is Wolf, and the vent, ovens, and wine fridge are Miele. The kitchen island is topped in quartz. 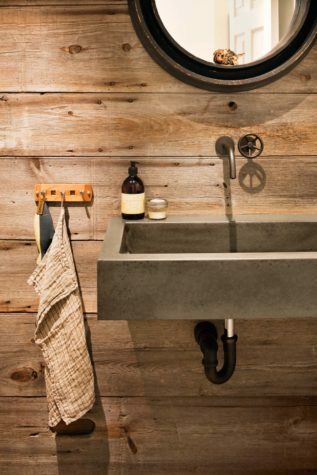 The rustic-chic downstairs bathroom features a concrete sink from Zenstoneworks and recycled barn wood paneling. 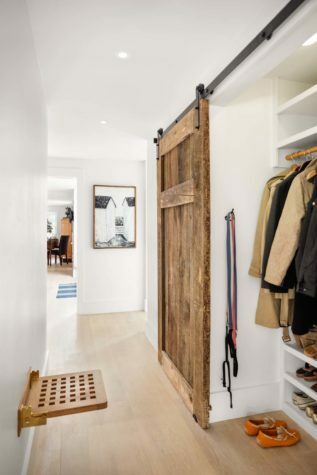 Builder Tim Spang created the sliding barn door from recycled wood that he happened to have in his backyard. On the far wall hangs a painting by Ingunn Milla Joergensen. Although Dagmar and Kevin Sullivan’s colonial home in Kennebunk features a traditional exterior (painted in Sherwin-Williams’s Flagstone) that remains largely unchanged from when it was built 16 years ago, the interior is modern and Scandinavian-style, thanks to a major remodel by Graham Architects and Spang Builders. The garden is all Dagmar’s work and has shade-friendly plants such as hostas, azaleas, rhododendrons, Solomon’s seal, hellebores, and hydrangeas. Two paintings by Ingunn Milla Joergensen hang on the wall in Dagmar’s living room near a potted fiddleleaf fig. 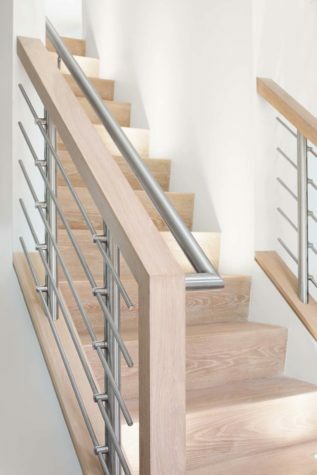 Dimmable LED lights line the white oak stairway, which was designed by architect David Graham and installed during the 2013 remodel. Blue and white teacups from Royal Copenhagen are on display in the kitchen. The dish towel, which features a screen-printed deer, was purchased in Denmark (where else?). The outdoor fireplace is the work of Leslie Vaccaro of Vaccaro Masonry, who used local stones from the Sullivan property in the design, as well as pieces of sea glass and shells. Boxwood hedges line the pool. 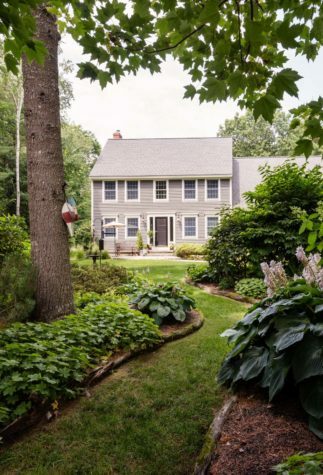 Inside a classic colonial in Kennebunk, Dagmar and Kevin Sullivan have created a modern home of plush comfort and streamlined style. Dagmar Sullivan loves to organize things so much that, “I would do it as a job,” she jokes. She invites me to take a look at her spice drawer. The sleek German-designed Poggenpohl cabinetry glides open without a sound, revealing a meticulously ordered drawer with every spice one could possibly need, from ginger to cumin to dill. “I’ll show you my closet in a minute,” she promises. 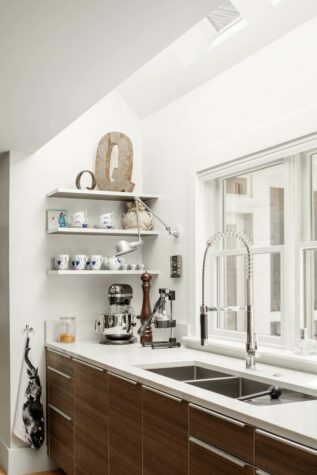 Her Kennebunk house, where she lives with her husband, Kevin, and her youngest daughter (her older two daughters have left the nest), is marked by this kind of sharp attention to detail and comforting organization. Remodeled in 2013, the contemporary space pays tribute to Dagmar’s keen sense of style as well as her Danish heritage. The house was originally constructed in 2000, built from a floor plan designed by Dagmar and Kevin themselves. “Once we lived in it with three kids, we learned a lot about the space,” Dagmar says. The size and layout of the home weren’t working for the family, they decided. But they didn’t want to leave their neighborhood. “In reality, I couldn’t leave the yard that I worked so hard on,” Dagmar admits. 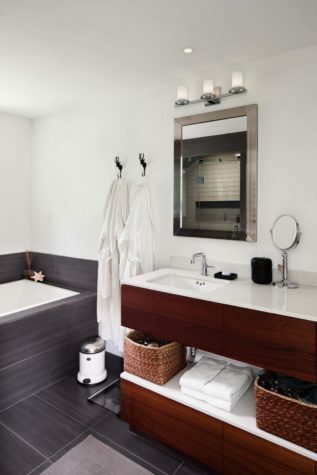 And so they decided to completely restructure the interior: they moved walls to create a larger kitchen, shifted the guest bathroom to a new location, added additional storage space to the entryway, and reconfigured the second floor to create a more natural flow. “We stripped it down to the two-by-fours,” Dagmar says. The couple worked closely with architect David Graham of Graham Architects in Kennebunkport to design the new layout in what Graham calls “a collaborative process.” “He understood my Danish style so well,” Dagmar adds. “We installed an entire energy recovery system in their house,” adds Graham, who worked closely with Spang on the remodel, which not only updated the interior structure of the home but also made it far more energy efficient. 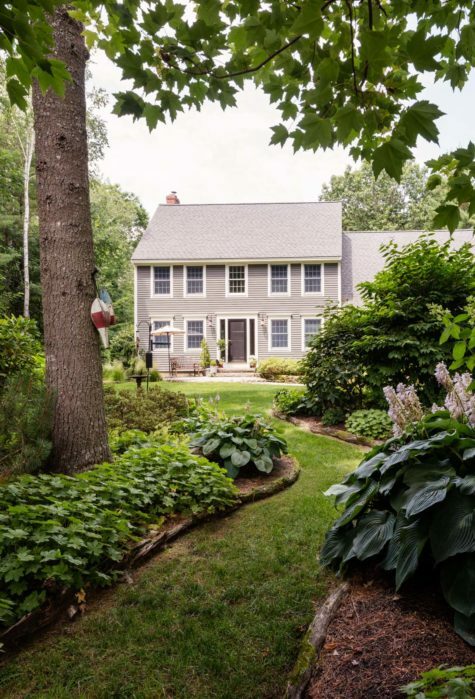 “We took the house from having a more traditional colonial floor plan to an open one,” Graham says. “It was also important that we bring in Scandinavian design elements to reflect Dagmar’s background.” The result is “a bit different from the other houses in this region,” says Graham. From the street, the Sullivans’ home, with its stained dark gray clapboards, appears perfectly suited to the neighborhood. Inside is a different story. You could just as easily be in a Copenhagen townhouse as the suburbs of southern Maine. 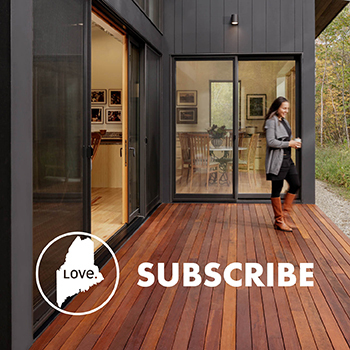 Fortunately, the simple lines of New England colonial homes pair well with Danish minimalism, and there are plenty of shared principles between Maine culture and Nordic style. 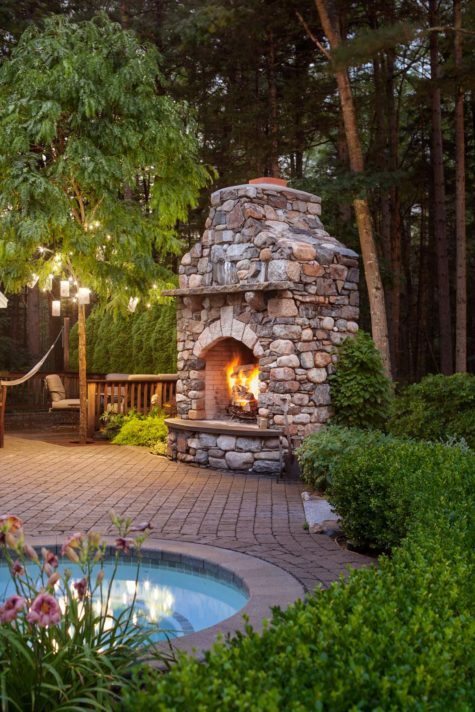 One of these shared values is the emphasis on natural elements, such as earthy gardens and toasty fires, both of which can be found on the property. 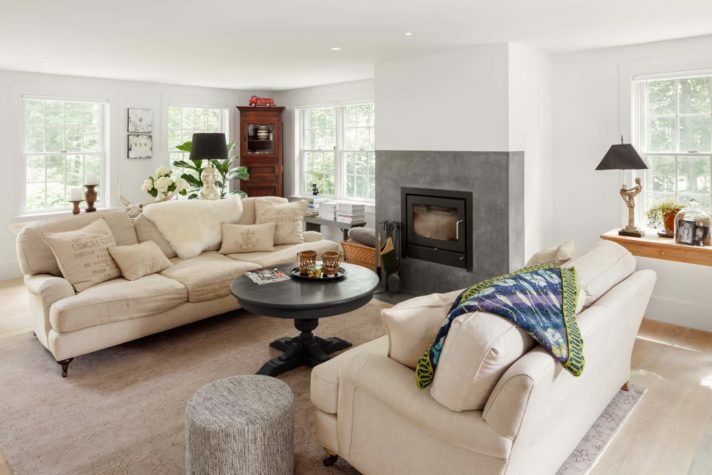 In the spacious and light-filled living room, embers are glowing in the modern fireplace (which Dagmar converted from an old-fashioned American-style piece to a contemporary Danish woodstove with an insert), and there’s plenty of wood waiting next to it. A collection of birch logs sits stacked in a rectangular, sharp-edged steel holder that Dagmar purchased in Denmark and brought back in a suitcase. Dagmar and Kevin are so dedicated to the comforts of wood-burning fires that they’ve installed an outdoor fireplace on the front patio and another one in the backyard. “For three seasons out of the year, we eat in the yard,” she says. “We wanted a big fireplace outside so we could have our dinner in the garden. We have a separate set of dishes for the backyard, too.” When all three of their daughters are in town, they like to spend hours catching up in the backyard, lounging in the garden, and eating late dinners al fresco. Old Port Specialty Tile Co.